Increasing capacity on a railway is not just about running more (or longer) trains. If the associated stations can’t cope with the increased passenger numbers, then remedial action is needed. Here, we look at major upgrades at Underground stations in general and at Holborn in particular. If too many people are attempting to enter a station then the short-term solution is simple, if not wholly desirable. You restrict access to it. It is not often that this is necessary at a surface-level station. Usually, it is restricted to exceptional circumstances such as passengers arriving after the end of a major event (such as a sporting fixture or concert) or a strike involving some rail services but not others. In the case of stations where the platforms are located underground, the danger of too many people wishing to enter the station can be mitigated by restricting flow through the inward ticket gates. This is not ideal and critics may well complain that this is a classic case of reducing the risk for which the operator is responsible (on his premises) by means of passing it onto someone else, rather than eliminating the source of the problem. If too many people are attempting to exit a station then the situation can be more serious. Particularly if it cannot be resolved by mitigating measures such as ensuring the direction of travel on escalators is prioritised for passengers wishing to exit. It is rare that a build-up of arriving passengers is sufficient to cause a safety risk but, when it does, the only real option available is to have trains non-stopping at that station. With Underground stations in the centre of London generally located within walking distance of the next station, this is viable, albeit unpopular. It is not hard to envisage the possible consequences of a station being temporarily closed (either totally or for passengers wishing to enter) in the centre of London at busy times. Many passengers will naturally head for the nearest adjacent station on the same Tube line. This station then becomes much busier than usual and is then itself at risk of closure. The real danger is thus the triggering of a chain reaction in which a number of stations are forced to close. When signs of this happening begin to emerge, or when experience tells line controllers that it is likely if the situation is left unchecked, staff are then faced with the unenviable task of closing a whole section of line. It was the fear of such a chain reaction that led to the need to make Bank Underground station fit for the future and prompted the half a billion pound capacity upgrade now currently underway. When Bank is forced to close, this puts considerable pressure on the entire Bank branch of the Northern line as potential passengers walk to Moorgate or London Bridge instead. It can be the case that a closure at Bank Underground station results in a closure of London Bridge Underground station just 13 minutes later. Left unchecked, and assuming passenger numbers revert to rising annually as they have done in past years, this meant that without the capacity upgrade we could have seen a situation where the entire Bank branch of the Northern line would be forced to close at short notice simply because of a problem at one busy station. The almost-as-bad-as-it-gets case is an Underground interchange station where there is interchange with two or more deep-level lines. This is, of course, the situation at Bank. Another station notorious for problems is Oxford Circus, although in contrast Green Park, with its numerous long connecting passages and about half the number of passengers as Oxford Circus, appears to rarely cause any problems – something that might well change in future. There is actually an even worse case than the interchange situation described above. This is where there is a frequent service on one deep-level Underground line built to National Rail gauge with high-capacity trains interchanging with a small traditional tube-sized line of limited capacity. This will be the situation at Bond Street and Tottenham Court Road when the Elizabeth line opens. These two stations were already suffering from overcrowding. They are being rebuilt as part of Crossrail, but would likely have been rebuilt anyway as part of a London Underground scheme, had Crossrail not have gone ahead. At both of these stations the London Underground side of the work is now complete. The recent opening of the new Bond Street entrance has been covered excellently by IanVisits (mainly photos) and Geofftech (video). Whilst modelling showed that Bond St and Tottenham Court Road would be capable of managing the expected passengers once the Elizabeth line opens, it was clear that a combined Oxford Circus/Bond St (Crossrail) east entrance could not. If you have ever wondered why the Elizabeth line has no sub-surface interchange with the Victoria line at Oxford Circus despite the eastern ends of the Bond Street platforms being tantalisingly close, this is your answer. As the Victoria line at Oxford Circus is never likely to be able to handle the expected numbers of people that would board if there were direct access from the Bond St Crossrail platforms, it appears the two stations will never be linked with publicly accessible passages below ground. Also on the Elizabeth line is Farringdon, which will not only be an interchange with Thameslink, but also with the Sub-Surface lines (Circle, Hammersmith & City and Metropolitan). Here, quite cleverly, some of the problems of interchange with existing Underground lines are dissipated by having the Elizabeth line station interchange with two Underground stations rather than one. Given the obvious benefits of increasing station capacity that are close to their passenger limit, you might expect there to be an intensive and ongoing programme of upgrades. In fact, they are few and far between. The reason for this is simple: they are typically very, very expensive. Given the history of London and the Tube network, the stations in question tend to be located at the most awkward places to carry out extensive construction works. Additionally, these places tend to be where land costs are extremely high. Such works therefore only tend to take place where there is a dire necessity – or a significant third-party contribution towards the cost of such works. To put rough numbers into play, the cost of Bank Station Capacity Upgrade will be well over half a billion pounds – as will the cost of Victoria Station Capacity Upgrade. In neither case is this even a full upgrade, in each case focusing on one particular line (Northern line and Victoria line respectively). At Victoria, there was once a plan to complete the job and improve the situation for District and Circle line passengers, but that plan seems to have disappeared. Perhaps the plan is to wait until Crossrail 2 and complete the job as part of that project. The planned upgrade at Camden Town, in comparison, would appear to be relatively cheap at a mere quarter of a billion pounds. As the current Camden Town plan would appear to be relatively simple, as these things go, and not in the centre of London where land prices are much more expensive, this would suggest that £250 million is the minimum start point for any decent deep Tube station upgrade that involves creating a completely new route to and from the platforms. Holborn station was recently the subject of a consultation on improving station capacity. 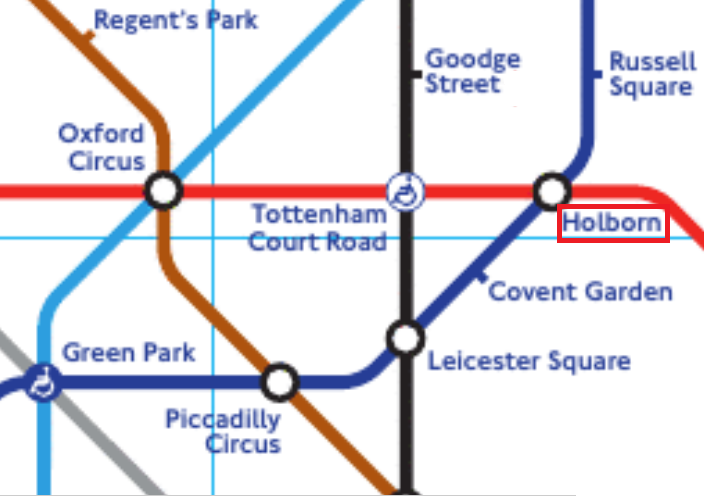 An obvious question is: why is Holborn next? To understand that, we must first understand the station’s history. As is often the case with old interchange underground stations in central London, the unsatisfactory nature of Holborn station stems from its historical development. First on the scene was the Central London Railway, forerunner of the Central line, who in 1900, as part of the original railway, opened British Museum station around 100 yards to the west of the current Holborn station. The Great Northern, Piccadilly and Brompton Railway, forerunner of the Piccadilly line, opened their station in 1906. Due to complexities in the amalgamation of two tube schemes separately authorised by Parliament, the station was complicated by the contemporary building of a near-useless short branch to Aldwych necessitating additional platforms at Holborn and having the main northbound and southbound platforms on different levels. The unsatisfactory nature of the two stations, Holborn and British Museum, reliant on lifts and a short street walk for interchange between the two lines served, was quickly recognised and plans prepared to do something about it. Partly due to the intervention of the First World War, it was not until the early 1930s that this happened. As the combined station had to be located at the intersection of the lines, it was clear that it was the Central London Railway that had its station in the ‘wrong’ place. The junction of Kingsway and High Holborn was the obvious place where a combined interchange station for the current day Central and Piccadilly lines should be. This may seem obvious now, but we can perhaps forgive the line’s early planners for not coming to the same conclusion, as it certainly wasn’t obvious until at least ten years after the latter line opened. Prior to then, Kingsway had not been built. The present-day station is located at the northern end of what was then a notorious slum area. Whilst the general value of its location may have improved, Holborn is still really too far east to be considered part of the West End, but too far west to be considered the heart of the City and the current lack of capacity at the station is clearly hindering the economic development of the surrounding area. Marketed as ‘Midtown’, or, worse still, ‘Bee Midtown‘, a not universally-popular epithet, the local business district has done much over the past few years to highlight how the lack of a fit-for-purpose Tube station at Holborn has held back the development in the area. This applies particularly to the north of High Holborn and it is a considerable walk (by central London standards) from Theobald’s Road, a fairly major traffic artery, to any Tube station. 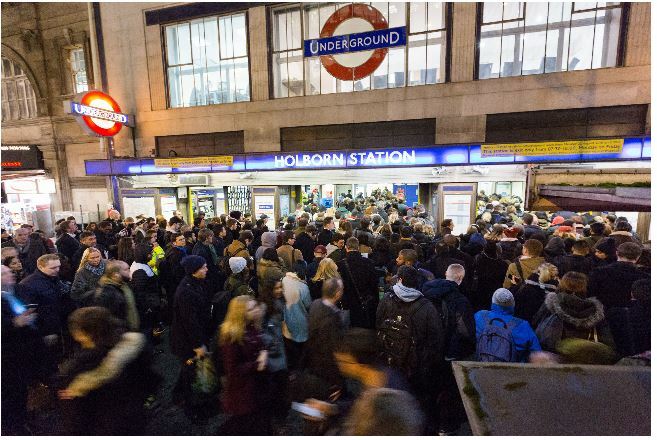 Worse still that Tube station may be shut due to overcrowding. It is pertinent to note that an early plan to have a Crossrail station at Holborn was abandoned. In reality, it would have been too close to Tottenham Court Road station to be really worthwhile. It would have restricted the alignment (bearing in mind that sub-surface Crossrail stations have to be straight and level). It would also have added considerable expense and may have put the entire project at risk. At the end of the day, it just wasn’t a good business case. Whilst a station on the scale of the Elizabeth line could not be justified, however, an improvement of the existing Holborn station could. Another answer to the priority given to Holborn is the fact that Tube station upgrades are judged not only on the local need but the overall consequential effect of not upgrading. On the Piccadilly line, Holborn station is flanked on either side by Zone 1 stations with lifts. Southbound, the next station beyond the adjacent station (Covent Garden) is Leicester Square which operates at capacity during evening peak hours when tourists and home-going commuters push the station to the limit. The saving grace with Leicester Square is that Charing Cross (for the Northern line) and Piccadilly Circus (for the Piccadilly line) are not far away. Clearly, one would not want to get to the situation where closing Holborn to inbound passengers forced the subsequent closure of Piccadilly Circus station. According to a presentation to Camden council in 2013, the construction at Holborn was due to commence in 2018 in advance of the Camden Town station upgrade. So, what has caused the Holborn Station Upgrade to be delayed? The answer is that the station work is closely linked to the Deep Tube Programme (DTP, formerly known as New Tube for London). Although the station work is not part of the DTP scheme, the DTP scheme is completely dependent on it. This is partly because the planned rise in frequency of the Piccadilly line (from 24 to 33tph) would mean that even having Holborn as an interchange-and-exit-only station would be unsustainable. It is also because the Deep Tube Programme (which includes the Piccadilly and Central lines – both of which serve Holborn station) needs additional power supply in central London. Supplying the considerable amount of extra power required would be much easier and much cheaper if done as part of a station upgrade programme. The current plans at Holborn would result in a new Tube entrance being built and in use by 2024, followed by refurbishment and enhancement of the existing tube entrance in 2027. The refurbishment would mean the existing Tube entrance would be closed for three years whilst the work was done. 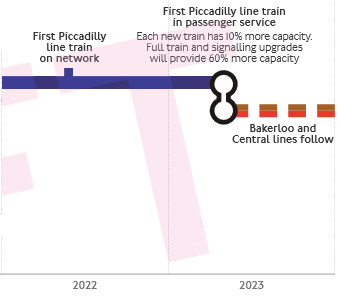 According to the latest TfL draft Business plan, the first new train on the Piccadilly line is due to enter service in 2023. If this is anything like the introduction of 2009 Tube Stock on the Victoria line, this means that one train will be in service for a round trip starting around 10.00pm on Monday-Thursday nights. The current rate of introduction of Class 345 stock on TfL Rail shows how painfully slow initial introduction can be and it could easily take a year or two to replace the 87 6-car trains now operating the service (actually 175 3-car trains, coupled together as a pair in service). At a recent London Assembly Transport Committee meeting, TfL’s Director of Strategy & Service Development, David Hughes, stated that the existing Piccadilly line trains were due for replacement ‘in seven or eight years time’. That would take us to 2024-25. Allow another two years for the additional trains to be brought into service ready for 33tph and for Platform Edge Doors to be fitted along most of the line (not Rayners Lane – Uxbridge, shared with the Metropolitan line, obviously) and 2027 seems a reasonable completion date for the Piccadilly line upgrade – the same year as works are due to be complete at Holborn. Again, to understand how Holborn must be rebuilt, one must first understand the work that was carried out when it was rebuilt before. Then, the Central London Railway platforms at British Museum needed to be replaced with ones further to the east and these new platforms needed to be linked into the ‘Piccadilly’ railway station at Holborn. In addition, the lifts at Holborn needed to be replaced with a suitable number of escalators. Unusually, Holborn was rebuilt with an escalator shaft with four escalators within it. This was unusual because normally the economics of tunnelling meant that beyond three it was better to dig two separate shafts. Unfortunately, the Central London Railway had been built beneath the streets with the running tunnels located next to each other, as was the normal practice for Tube lines. Consequently, adjacent platforms connecting on the level with interconnecting passages was not possible for the ‘Central’ platforms and the platforms had to be built on the outside of the running lines. 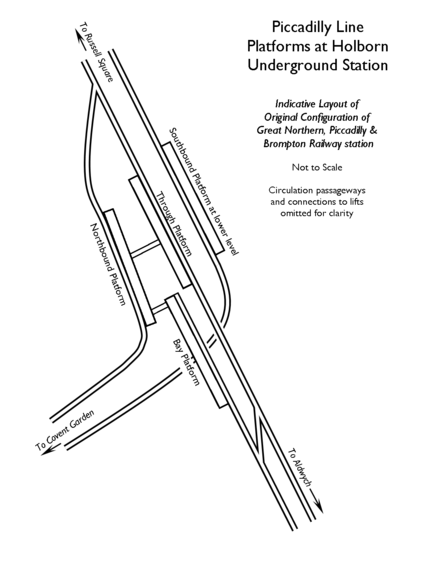 This, unfortunately, meant that same-level interchange was not possible between any of the four main platforms at Holborn station. Today, this scenario potentially complicates any attempt to build a second entrance to the station. Worse still, the 1930s Holborn station seems to have been designed in an era where the science of understanding passenger flow wasn’t exactly mature. Having all the escalators together and requiring interchanging passengers (for whom the new station was supposedly built) to pass through the landing at the base of the escalators means that all passengers have to pass through this crowded area. In essence, to sort out Holborn station TfL wants to build a new station entrance in Proctor Street, next to Red Lion Square. 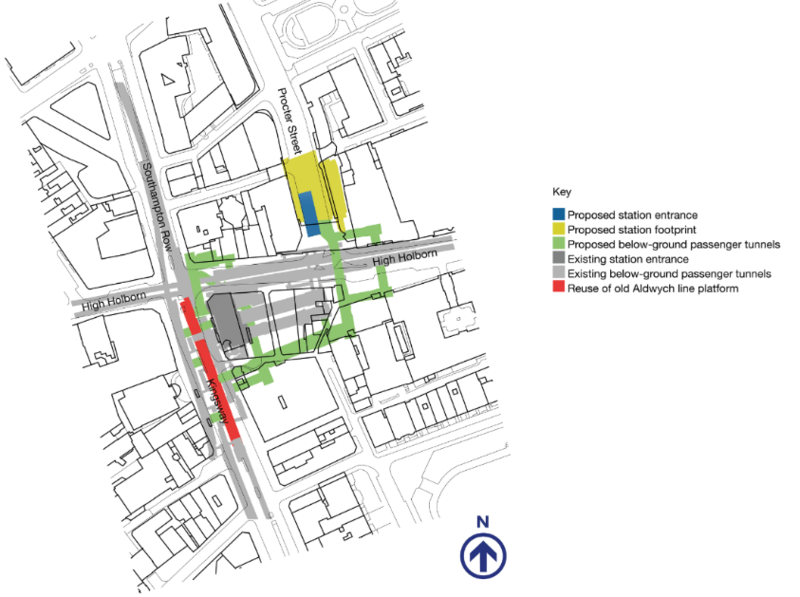 Proctor Street is currently a wide, one-way street and TfL propose to reduce the width of the road to enable a modern station entrance to be built. 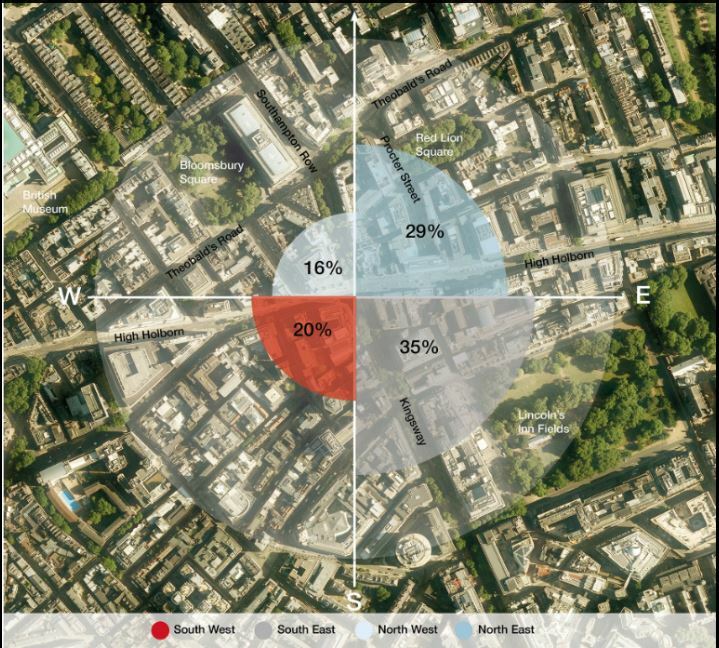 Apart from the obvious benefit of not having to acquire land, two attractive features of the scheme are that it manages to avoid being located in the multitude of conservation areas surrounding Holborn station and that it is to the north of High Holborn, where future demand is expected to be highest and where there is the greatest requirement to stimulate business growth. The issue of avoiding conservation areas is a big one – and one that the consultation team at TfL are quite open about. The Crossrail 2 team also take this into account when choosing sites for station entrances. It makes the planning process easier to get through. Another obvious point is that if you built an Underground station entrance across approximately half the width of the road, it is going to have an impact on traffic (including buses). Clearly, the traffic measures adopted are going to be integral to the success of the scheme as a whole and a later consultation will cover this. A side effect of choosing a station entrance located in the current roadway in Proctor Street is that there can be no oversite development. Whilst this is a disadvantage as it means that costs cannot be offset by the sale of the right to build above the station, this does at least simplfy the planning process. The new electricity substation would be located in the basement of the new station entrance. From street level, there would be two escalators and a wide set of stairs to the ticket hall and three sets of escalators down to the platforms. Surprisingly, there will not be any lifts. It seems that there is no requirement for these to be present at every entrance to a rebuilt station and it will be easier and cheaper to reuse the original lift shafts at the original entrance to the station for this purpose. Upgrading the station will be costly, but it would be even more so were it not for the intention to undertake a creative bit of historical recycling – the plan is to re-purpose one of the former Aldwych platforms. Unfortunately this is the through platform – the only way for trains to be routed down the still-extant branch line. Consequently the Aldwych branch, no longer in passenger use but still used for filming, will be permanently severed from the rest of the Tube network. Piccadilly line crayonistas please take note. Undoubtedly, the use of the Aldwych platform will arouse emotions, including sadness that this heritage feature will disappear. Nonetheless, others will be pleased to see old infrastructure being used imaginatively for a new purpose and look forward to a heritage area of a former Tube line becoming accessible to the travelling public. It is early days yet and it remains to be seen what plans will be made to acknowledge and include that heritage in the updated station. There is talk, however, of the platform tiling being retained. Under the current plans, the new Holborn station entrance in Proctor Street will open in 2024. This will enable the existing station entrance to close for three years for improvement work. With the new Proctor Street entrance it is less important for the current station building to have an entrance directly onto High Holborn, so the current, restricted, entrance will be blocked off and all access will be to and from the existing Kingsway side. Lifts will be reinstated in the original lift shafts to make the station fully accessible – albeit only from one entrance. A rather unsatisfactory current feature that sees a fire exit from a nearby office leading into the Tube station ticket hall will also be addressed. The fire exit route will be rerouted to be completely independent of the Tube station. Apart from permanent road traffic issues after opening, it would seem that there really would be few reasons for people or organisations to object to the principle of the scheme as opposed to the manner and inconvenience of construction. Planning applications of this nature normally raise a host of objectors but many are actually in favour of the scheme as a whole but are forced to go through the formality of objecting to ensure that their particular issues of concern are addressed by the planning inspector. For example, it is common to see local councils lodge an objection that generally starts ‘whilst we strongly support the scheme in principle, we object to the proposals in its current form because…’. Whilst the TfL Transport and Works Act team involved with this project must never take anything for granted, it appears that the biggest concern is to satisfy those who believe they will be adversely affected during construction. Similarly, that the work can be carried out without causing either general traffic chaos or undue problems to certain individuals such as the loss of access to private off-street parking. There is a lot of spoil to be removed and the only realistic option is by lorry – and, of course, almost certainly particle-emitting diesel lorries at that, although one wonders whether the temptation to revive an early Crossrail plan to remove spoil via the old tram tunnel and nearby post office railway at least crossed TfL’s mind again. More seriously, Camden Council will have introduced their Tottenham Court Road scheme by the time construction begins, eliminating through traffic (except buses and cycles) from Tottenham Court Road. Oxford Street is expected to be fully pedestrianised by then. The rebuilding of Euston station as part of HS2 will likely be taking place less than a mile away is going to cause further problems that will ripple over a large area. Of particular potential concern is Crossrail 2. 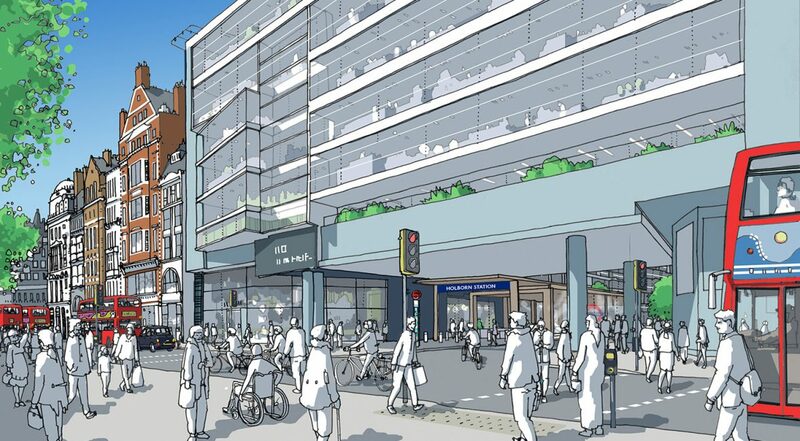 If this scheme goes ahead that will mean major works in nearby Shaftesbury Avenue as Tottenham Court Road station gets enlarged once more. And next on the Piccadilly line? In central London the Piccadilly line suffers from a combination of unmet heavy demand and stations operating at capacity. It is clear that to fully take advantage of a proposed increase in frequency from 24tph today (the absolute maximum achievable) to 33tph in future means various station issues along the line need to be addressed. Holborn is merely the first and most crucial of these. After Holborn, TfL’s focus is expected to turn other central stations. Covent Garden, still relying on lifts despite huge modern day footfall, is probably that next station that will urgently need addressing. The next station westbound from Covent Garden, Leicester Square, has for years been restricted by its limited access. It would appear from the anecdotal evidence that passengers unable to use the station simply walk to nearby Piccadilly Circus (for the Piccadilly line) or Tottenham Court Road for the Northern line. This station too is starting to appear on TfL’s radar for station upgrades. Beyond Leicester Square is Piccadilly Circus. An upgrade here is going to be problematic as land prices are high and potential worksites limited. Nevertheless, if the Piccadilly line service is increased to 33tph and the Bakerloo line is also increased to that, or higher, frequency in a post-Lewisham-extension world, it would be hard to see how the issue of capacity at this flagship station could be avoided. By the time the Deep Tube Programme delivers the new Piccadilly line trains, Piccadilly Circus station will have operated with its current footprint for over 100 years – an era when horse-drawn transport had not entirely disappeared from central London streets. Incredibly, TfL are even thinking that they may have to upgrade Green Park yet again. The park by the station has seen workings for the Victoria line, the Jubilee line (phase 1), the Jubilee Line Extension and step-free access with a new entrance to the park. Certainly, if the future moving walkways (aka travelators) between the Northern and Central lines at Bank station are a success, then Green Park station is an obvious location where something similar could be considered. To the north of Holborn station is Russell Square – another of those few Zone 1 stations with only lifts and an emergency staircase for access to the platforms. Whilst there is no inkling of any plans to change this, it does seem hard to envisage how this surprisingly-busy station, popular with local hotel customers, could continue as it is after completion of the Deep Tube Programme. With the TfL budget being squeezed one has to be a bit sceptical about any future scheme. Currently, the big scheme in progress is the resignalling of the Sub-Surface Railway. That has to go ahead because without it the benefits of higher frequency on those lines cannot be realised. The Deep Tube Programme has to go ahead in some form because Tube trains don’t last forever and there eventually comes a point at which it is more cost-effective to have new trains rather than soldier on with the old ones. If the Deep Tube Programme is to deliver a better more-frequent Piccadilly (and Central) line then Holborn station capacity upgrade is essential. The challenge will not be finding the money, or even the engineering, but finding a way of building it without causing disruption over a considerable area of central London. The planning documents make very clear that “retention of .. this specific artwork is (not) required”. The design underground will use the “Design Idiom 2015 palette” instead. Thank you for that link, I hadn’t realised the level of detail at the station. A shame indeed if they are not kept. I think one can even consider pedestrianising the Aldwych branch itself to improve access from the SE; Add intermediate exits (and/or utilise Kingsway tram tunnel) wherever applicable. “To the north of Holborn station is another of those few Zone 1 stations with only lift”. I assume this is Russell Square? Not named. Interesting article. The list of station upgrades in central London looks expensive and with TfL budgets as they are, it will be interesting to see how they get to progress them. At present, money is ridculously “cheap” – low interest rates, but major infrastructure projects are being deferred, because of “austerity” … later on, in the near future, one expects there to be more money available, but it won’t be “cheap”, because Interest rates will have gone up. Surely I am not the only one to notice that there is something wrong, somewhere inside these arguments? Yes it is Russell Square and I have now explicitly named it. The whole issue of borrowing is an interesting one. It is certainly true that TfL can borrow money very cheaply though its credit rating is not quite as good as it was. I understand they are close to being ‘maxed out’. There is also the issue that they really want to keep their credit rating good (it sometimes gets mentioned in Commissioner’s Reports) – presumably because it affects leasing costs and other financial transactions. The trouble is, for large enterprises, the more you borrow, the less good your credit rating. So there is not a lot of wriggle room and you do want to keep some contingency available for emergencies. I suspect a greater problem is that you can’t just borrow willy-nilly. It needs to be for a capital project that shows a return on investment for it to be considered ‘prudent’ borrowing which is what is assessed. This may work for extra rolling stock and even replacing rolling stock that needs a lot of expensive work on it to keep it in service. It probably doesn’t work for station upgrades that are unlikely to bring in much extra revenue – until you get to the point that people can’t make the journey at all from that or any station nearby. In any case, I think this is irrelevant here. We are where we are today. I don’t think money is the critical issue on this project. It is timescales and satisfying the planning inspector that proper measures have been put in place during building to minimise inconvenience to others and that the benefits outweigh any remaining inconveniences not addressed. I imagine TfL have only a limited amount of human resource to manage such expensive and complicated station rebuilding schemes anyway, so they have to be necessarily rationed. There are a surprising number of lift only stations in that general area, when you consider Russell Square, Covent Garden and Goodge Street, all of which have tiny surface buildings too. I can’t see any being rebuilt within the next 20 years though! There’s quite a few pressing issues with regards to station upgrades – realistically there’s either going to have to be a lot of money spent, or some sticking-plaster solutions coming! It would be a shame to waste the tunnel to Aldwych, but the cost of installing a new lift at the end (or anywhere along the way) makes it unviable for conversion into some kind of pedestrian travelator route. In terms of stations that should be in the queue for a major upgrade after Bank and Camden Town, can I submit that Elephant & Castle needs to be on the list? A pair of badly connected lift-only stations, serving an area that’s about to become much busier with the completion of Elephant Park, and the prospect of the shopping centre being turned from a zombie film backdrop into somewhere people might actively want to go… not to mention that there’s a Thameslink station hidden away down a nearby backstreet. The Bakerloo line extension might almost be justified by the need to sort the whole mess out! One of the options in the Bakerloo line consultation was where the Bakerloo platforms at Elephant & Castle would be sited. One would assume that brings with it at least one new entrance. 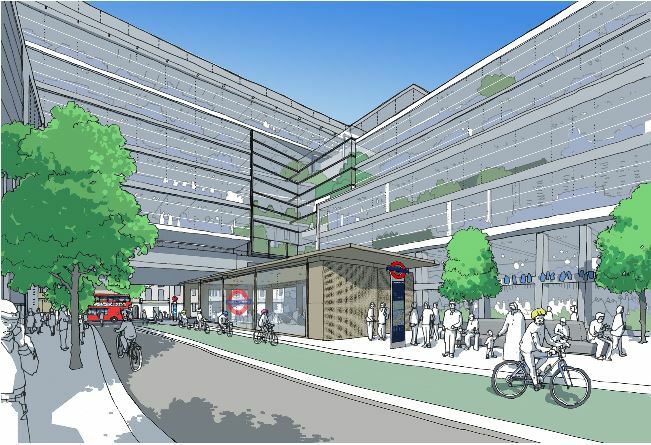 Are the final passageways onto the Central Line platforms really as narrow as they look in the consultation document? And if so who, even in the thirties, thought that it was a good idea? Correct me if I am wrong please but Bond Street Crossrail/Elizabeth line’s eastern exit at Hanover Square does go someway towards providing an “Out of Station” interchange with Oxford Circus station as they are only minutes apart on the surface as one is on Regent Street and the other just off it. Unfortunately – yes. And it’s worse on the “Picc” actually. It’s even closer than that. IIRC, there will be/are connections into Oxford Circus’ tunnels from the Hanover Sq end of Bond St CR1, but, they are intended for emergency use only. When the Deep Tube Project was the Deep Tube Upgrade (pre NTfL) some pretty unflattering comparisons were made between the Victoria line stations and the Piccadilly line. With an increase from 24 trains per hour to 33, possibly 36, it was obvious that a lot of stations would be in trouble. Earl’s Court, South Kensington, Green Park, Piccadilly Circus, Leicester Sq., Covent Garden, Holborn, and Russell Sq. were all on the list. I am not surprised that Green Park might be back on the list, given that the escalators are right at the west end of the platforms. At the time – circa 2010 – LU was making a lot of noise about it’s vertical integration – track and train – but there was still a gulf between trains a stations in terms of capacity planning. This was possibly for the reason cited; fixing that lot could easily cost £4Bn and might have blown the fledgling upgrade out of the water! The Victoria line is not without its problems. Since retiring, I avoid Euston Victoria line southbound in the morning and northbound in the evening peaks. The combined number of Northern Bank branch and Victoria line customers trying to use the single down (morning) or up (evening) escalator to/from the platforms leads to some long queues and, in the evening, the queues don’t clear before the next train comes in. I notice that the consultation cut-away diagram labels the Piccadilly line platforms incorrectly. I presume filming will still occur at Aldwych, but any train movements will depend on the magic of CGI. It seems odd that current demand is 64% to the east of Kingsway, but the new entrance is expected to receive 50% of users. I presume 14% of demand is from immediately east of Kingsway, which will remain the closest entrance. Elephant tube will be getting an upgrade as part of the shopping centre development – the proposals for which are due to go to the Southwark planning committee on 18 Dec. I’m not sure exactly what is proposed but the proposal includes a new station entrance and station box. The planning ref is 16/AP/4458 if you want to look it up. Taz – I imagine that many people whose destination is on the south side of High Holborn will continue to use the Kingsway entrance in preference to crossing the road, and more so the further west that destination. As for Leicester Square, one of the biggest problems with the station is that the exits feed directly onto narrow pavements which means that the narrow staircases to those exits are not always the limiting factor for how many people can leave the station. To relieve it and Piccadilly Circus perhaps a combined Crossrail 2 station could be built between them with a huge entrance just off Leicester Square – I don’t know if this is possible in engineering terms, let alone economic ones though. You can’t do too many major projects at once, partly because of a lack of skilled resources, but mainly because work at one station necessarily pushes some passengers to use the neighbouring ones in the interim, and you don’t want that one being done at the same time. ” At present, money is ridculously “cheap” – low interest rates, but major infrastructure projects are being deferred, because of “austerity” … later on, in the near future, one expects there to be more money available, but it won’t be “cheap”, because Interest rates will have gone up. The insights of J M Keynes are out of fashion, in some quarters. I’m still hoping for a ‘museum train’ shuttle on the Aldwych branch. Sorry Bryn, I can’t see it happening. The disused platform at Holborn will loose its track and become a passenger concourse. That means the traction current supply to Aldwych will be cut, and the train there will not be able to return for periodic maintenance as it does today. The Piccadilly new trains must await resignalling of the sub-surface lines, since there isn’t money for both. However, with urgent need for new trains on the Piccadilly and then Bakerloo, it seems the plan is to deliver new trains and then new signalling on those lines. Any automation with platform edge doors is to be left to some future unspecified time. This postpones the costs and complications, staff disputes, etc. The Central line new trains will then follow on. However, the current Central line trains have proved unreliable since delivery in 1992, and are due to receive a major upgrade by 2022. If that results in a step-change in reliability, which is the intention, then perhaps the Central line can then receive a service upgrade in the way the Jubilee and Northern lines are now planning without more trains. There are plenty of reversal points on the Central line to enable a boost to the central area service. If the existing trains are then capable of another 20 years service, perhaps funds will become available for further station upgrades instead. On London Underground, if nowhere else, should this be “travolators”? Surely TfL must have plans to upgrade capacity at Oxford Circus as well? And what about Euston where there are dire predictions of its inability to handle HS2. From what I have seen a new station box at Elephant & Castle will have new escalators down to the Northern Line. Rough cost of £150 million, I think from some regeneration funds, Bakerloo will have to wait for the extension. Upgrading Leiceter Sq is relatively easy. There are pedestrianised roads to the West and East of the ticket hall. How much they spend on that depends on how wide the new staircases / escalators were and how far west they pushed the entrance away from the Ticket Hall. It would depend on if they still needed service vehicle access down those streets and what state the utilities were under the street. But One 12 foot wide staircase direct towards the Square would make a big difference. The November LURS meeting about Crossrail 2 learnt that, without further investment, 17 stations can expect peak-time operational problems by 2041. These include NR interchanges at Euston, Kings Cross St Pancras, Stratford, Liverpool St, Waterloo, Victoria and Clapham Junction. The other stations were the 3 Clapham stations on the Northern line together with Stockwell; also London Bridge, Leicester Square, Holborn, Warren Street, Highbury and Finsbury Park. Crossrail 2 is intended to relieve most of these. The article and recent comments overlap with a wider policy issue, of how to render main railheads more accessible from a substantial catchment, alongside the topic of addressing forecast levels of station overcrowding internally and at station entrances/exits. Part of that text says: “Maybe part of optimising Peak Tube capacity could be the quality of surface access within an effective Crossrail station catchment, and how that might be enlarged through subsidiary entrances / exits.” The same comment could apply at main tube stations. In the case of Holborn, the new Proctor Street access as shown as assisting up to 29% of existing entry/exit flows, which currently are hindered by the pedestrian/road conflict at High Holborn with intensive one-way traffic flows. The article notes that this quadrant is foreseen as becoming much busier, which reinforces the case for an additional entry/exit in that direction. However the diagram of percentage destinations in four quadrants shows that the busiest quadrant (35% of destinations) currently is the E-S quadrant, historically served by major north-south bus flows, the Kingsway Tram Subway and the Aldwych tube shuttle – and, not yet, by the Cross-River Tram.. However, it is unclear from the article whether a wider approach is being adopted, to integrate the revised Holborn entry/exit arrangements into a better fit with the WHOLE effective catchment. In a situation of constrained budgets, this possibly would rely on a review of bus routeing and stop locations, and place-shaping works along the main and minor street patterns to benefit pedestrian flows. 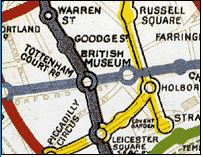 For example there is reference to narrowing of Proctor Street, and the pedestrianisation of Oxford Street, but not to the broader Holborn catchment which will overlap with Tottenham Court Road, Russell Square and Chancery Lane station catchments, and southwards will extend as far as the newly-named ‘North Bank’ quarter (a ‘BID’ to ‘place-shape’ the entire Aldwych street environment, including some further limitations on bus operation…). It would be desirable to see some larger-scale joined-up thinking about all of this, otherwise there is the risk of the necessary tube access investments not getting best value for money, while the street-level mobility and access topics might not be co-ordinated adequately to ensure consistent benefits for pedestrians and buses. Can I make a plea for an extra “box” in the main-page sidebars? For useful / relevant upcoming meetings likely to be of interest to “us”? LURS & “Loco & Carriage” come immediately to mind & I’m sure there are others. Yes – once again, the “big picture” is being missed. I for one, see no good at all coming from the proposals for removal of buses from Oxford St (etc) simply because connectivity will be lost & bus passenger numbers will spiral down even faster – but no-one seems to be looking at the integration of bus movements/passengers with tube movements/passengers. I could quite easily be wrong, but it seems that TfL have missed several tricks here? Whilst I wouldn’t dissent at all – on the contrary – from Jonathan’s comments, as a frequent user of the buses from Euston and Holborn towards Aldwych, it is noticeable how much delay to both road and pedestrian traffic is caused by kerbside activities (generated apparently by a fruit stall and a paperstand, and possibly by servicing Great Turnstile) in Kingsway at the junction with Holborn. The traffic is reduced to a single lane, having been two lane south of Bedford Square. It takes anything up to 10minutes to clear the junction by road and very visibly,the stalls cause pedestrians to back up into the station because the pavement is narrowed. My point is that it is essential in redesigning the “public realm” to look at what is actually happening – the stalls wouldn’t show up on any plan .- and to bear in mind that there are some partial solutions which may cost very little to implement (eg better enforcement or buying out a stallholder). As an employee in Procter House during the 60s and 70s I know from personal use that beneath Procter Street is the car park for the House. Its entrance was in Catton Street (North side). Although Google indicates the ramp has been built over there still appears to be an entrance there. The consultative map shows the proposed station footprint taking up most of the car park. I know that Procter House has been redeveloped since BT left. Procter Street did not exist before the Procter House. I would be interested in who owns the proposed station site. I assume the to-be-severed Aldwych branch does not currently provide a contingency turnback facility allowing the northern part of the Picadilly line to continue in the event of disruption in the southern? Such a possibility would clearly be lost by the severing. Nor could it conveniently with the present track layout. Nor even with any simple additions. The through platform from Aldwych is only connected to the northbound through Piccadilly line, whereas the southbound Piccadilly line is at a lower level. Apparently in the early days there were some through trains for homegoing theatregoers, but only northbound even then. (Presumably an out-of-service northbound train reversed into the through platform to form this service). And yes, for northbound read (technically eastbound) as that is how the Piccadilly is technically oriented, even at Cockfosters. @Malcolm – absolutely – you have only to look at the to-ing and fro-ing in the WTT of the Aldwych set, back in the day, as it went back to the depot. It is intended that the issues of Holborn and traffic in particular will be the subject of a separate but related consultation. I think Long Branch Mike tried doing a diary but it was time consuming and little used. Also, it relied on getting feedback to tell us what was happening but this wasn’t forthcoming as far as I am aware. All these things are timeconsuming. It is very easy to suggest things for other people to do. On the subject of LURS, it meets every second Tuesday and future meetings are on their website at http://www.lurs.org.uk/meetings.htm so it shouldn’t really need to have us taking up space on our website to remind people. By the way, the speaker in January is Viki James who is both very informative and entertaining. She is responsible for preparing the draft Transport & Works Act Order for various station upgrades (amongst other things) and is remarkably well informed. Bank, Camden Town and Holborn are all stations she has prepared or will prepare documents for. She is also a very useful person to speak to at consultations on station upgrades if one is thinking about writing an article on them. Can’t answer your question but on of the things to come out of the drop-in for the consultation was TfL hadn’t realised their proposed worksite was blocking the entrance to an underground entrance to residents subterranean parking spaces. This is really the sort of things consulations are actually for – to see if something comes to light that has been genuinely overlooked. I had kept the Events page updated for several months. It appears that the Industry posts are more popular. Being extremely pedantic both TCR and Bond St had / have LU and Crossrail projects working jointly to build their respective elements. A former colleague had commercial oversight of both LU projects. In terms of buses and Holborn it is worth noting that the 242 has gone from Holborn and the 25 is intended to follow – probably next year. That would leave the 8, 243 and 521 having to use Proctor St. The 243 could be diverted easily to run via Southampton Row s/b which leaves the 8 and 521. The 521 is only very frequent in M-F peaks and the 8 will probably be reduced in frequency in line with every other bus route in Central London. Whatever routes are on the N-S axis on Kingsway will probably be subject to further rationalisation at some point thus reducing traffic impacts there. Nice to see Vicky J being mentioned in positive terms. A former colleague and someone who I’ve encouraged in the past. I agree she is very good at her job and nice to see she’s doing well. On the general theme of station capacity then I’ve nothing too specific to say about the Holborn scheme. It just needs doing but it will leave a very complex station to operate. I also wonder how well the place will run for 3 years just using Proctor St as the entrance (assuming I’ve understood the article properly). That is surely going to mean people still queuing in the street at peak times? Although unstated by PoP another issue for these very overloaded / congested stations is fire evacuation and how close they are to the limit in meeting the required evacuation times safely. Adding capacity and more routes to the surface and improved fire fighter access all help. 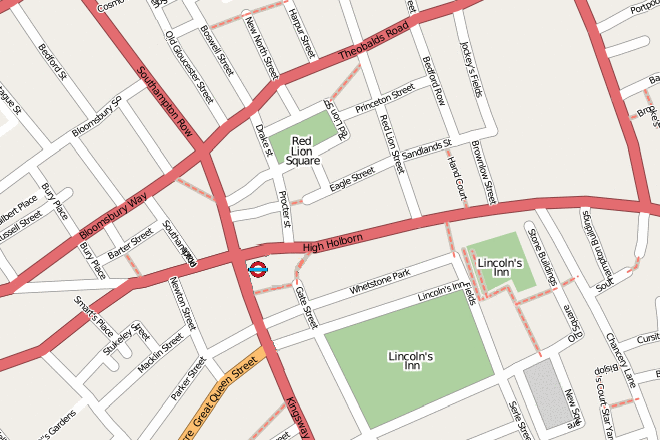 @ Chris M – can’t see TfL pushing to have CR2 opening on to Leicester Square. They will have enough of a battle on their hands with the planned site on Shaftesbury Av given this means more disruption for Soho and the loss of the Curzon cinema which has already a lot of negative comment. Trying to take on Chinatown and the cinemas on Leicester Square and the huge electricity substation under the square is probably too much of a stretch. It is only the walk of minutes from Leicester Sq tube to Shaftesbury Av so no great need for a more southerly entrance to TCR CR2. You also run the risk of TCR station no longer really being at TCR if you keep stretching where it’s entrances are. @100&30 – interesting observations about the Picc Line upgrade’s impact on so many stations. I can’t see where TfL are going to find the cash to do substantive work at the several stations that will require attention. I’m very familiar with Leic Square and one of the big problems there is how narrow everything is – platforms, stairs, corridors. I can’t see how there is an easy fix for that unless you start “doing a Bank / Angel” and divert a running tunnel to create more platform space. You are then talking major money. @ Taz – have to say I’m a tad concerned that we may be looking at over 10 years from now before we get anything remotely like a fully operational Picc Line Upgrade. Even if the trains do come first that poses risks for a long time around how that line works. It’s beginning to resemble (on paper) the extended “mess” that was the never ending, always breaking down upgrade of the Central Line back in the 80s/90s. Remember the horror stories with that? Working on a line for nigh on 10 years is a very long time indeed. Forgive my concentration on the Aldwych branch connection, but I’m skeptical that such a decision to permanently sever the connection should just be accepted by default as an example of egg shells and omelet. TfL’s own study into wifi usage and peak travel patterns between central London stations revealed that between KX and Waterloo a large number of people took the Victoria line and Jubilee, presumably because of the minimal number of stations such a route takes. If the Aldwych branch had, as previously proposed, been extended onto Waterloo, this would nowadays provide a service of far fewer stops between the two points, albeit still with a change. This may or may not still prove justifiable in the medium or long term to build, but one can be certain that as soon as concrete is poured on the track bed at Holborn it becomes sufficiently less imaginable to ever be considered. I fear there is a bias against any such thing being considered fairly because closed infrastructure is seen automatically from a negative perspective, rather than one of potential and opportunity. Even without wishing to push crayons for just a minute, Aldwych still gives revenue in the form of filming income. This leads me to think whether, instead of a solid floor at Holborn, a removable or even hinged platform bridge could be used just over the track to at least enable transfers to take place should they ever need to in the future. If something were hinged it could be moved out of the way relatively simply without the need for spanners and wrenches and such tools. The point I’m trying to make is would it really cost anything more for such a solution to be used against gutting the track bed, digging it out, removing cables, then forming a pour over? @ Walthamstow Writer: The modified diagram from the Business Plan (see above article) indicates that the Picc line upgrade is complete when the first train enters service! If the first train begins in 2023, and they can commission a train a week for two years, then all old trains could be replaced in 2025. The new signalling could be installed during this time, to be commissioned once the last old train is withdrawn, with a driver retained to press the start buttons as on other lines. But this will not just be an updated Victoria line train, but a radical new design with open-ended cars with a shared bogie beneath, air cooling, etc. Can all this be satisfactorily tested in computer simulation, or should there be an extended period of trial running? Look at recent experience of delivery of conventional trains for the Victoria and sub-surface lines! @Ben On the contrary, an excellent use has been found for this piece of disused infrastructure: an expanded passenger concourse, saving millions on the need to create additional tunnels.which enables the Holborn station upgrade to go ahead at an affordable cost. If a rail link between Aldwych and Waterloo/Holborn (or wherever) is ever needed then it will likely make more sense to just build a brand new tunnel rather than use the toy-sized Piccadilly line gauge. @ MALCOLM 3 December 2017 at 21:30. There is more detail on the Aldwych theatre train on page 55 of ‘The Aldwych Branch’ by Badsey-Ellis and Horne (Capital Transport 2009). It ran limited stop to Finsbury Park, initially from Holborn from October 1907 prior to the branch opening on 30 November 1907. It was withdrawn after 5 October 1908 and was the only passenger train ever scheduled from the branch to the main line. Re: the section on Farringdon. Is Crossrail still planned to connect to Barbican? A year in advance of it opening there appears to have been virtually zero work done there or refurbishment of the station, which looks horribly dated. Also I am confused by the comment about waiting to see if the moving walkways at Bank have been a success. Such technology has been in use at Waterloo between the Jubilee and Northern/Bakerloo lines since 1999. We are getting off-topic but I would imagine most of the current Crossrail work at Barbican is underground so you won’t see it. 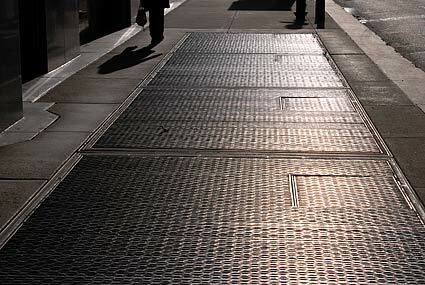 And, if they are using Farringdon as a work entrance, you won’t even see any activity on the surface. As for no work done to refurbish the [existing] station, I am pretty sure this is not Crossrail’s responsibility. It is up to TfL whether they do it. I cannot recall having seen any money budgeted for this. Then again, if it is a small job, it would not appear individually. They may want to wait until Crossrail is off completely off the site. Also, they may want to combine the work with converting the former widened lines to stabling sidings for Circle line trains. Not denying the long existence of moving walkways. The have been around for a long time and are common in airports. And, as you say, on the Jubilee line. But they can be challenging to fit into existing stations. I know that Waterloo was an existing Underground station but both the Jubilee line platforms (and the running tunnels) were new. So there we are talking about designing them into the upgraded station from the outset and things like the location of station platforms can be modified to take them into account. In the case of Green Park, and to a large extent, Bank, you have to design the moving walkways into an existing station structure with limited or no opportunity to realign other parts of the station to take them into account. I notice the large London College of Fashion building next to Oxford Circus is going to be redeveloped. Not sure what the plans are, but it would be a great site to have even a small ticket hall or some kind of station extension. You get quite high foot traffic around Cavendish Square, so getting some people avoiding having to go to Oxford Street to access the station would also fit wider objectives. @ James 1037 – The “interchange” at Barbican is a low capacity link. From my recollection of the plans the only physical work at Barbican is at the west end of the LU platforms where steps / lifts and an overbridge will be installed. PoP is correct that most of the work is not visible as it is within the eastern ticket hall / lower concourse structure that Crossrail are building at Farringdon. However I will admit to being a tad surprised, when I was last down there, that no visible work had commenced on the LU platforms. I’d have expected something to have been started by now to start opening up the LU structure on the e/b platform to create space for the lift and foundations for the bridge. Perhaps it is being left as a last piece of work that will be done within a concentrated timespan given it’s relative simplicity? However you’ve still got power / lighting / lifts / CCTV etc which will all need commissioning and integrating into the overall stn systems at Farringdon and possibly some form of indication at Barbican. Depends on the operating regime that’s been decided in respect of the lifts and evacuation protocols. I am not expecting any refurbishment of Barbican LU to take place.unless LU are going to find the money. It’s certainly not in Crossrail’s scope as I asked about this on a site visit to Farringdon a few years back. Charing Cross’ Jubilee line platforms are available (as seen with James Bond in it in Skyfall, though they also CGIed it and made a set for ‘Vauxhall Cross’ in The World is Not Enough) and are used about as often as the Aldwych one (which would still be there as a platform, you just wouldn’t be able to get a train there). Of course, if the film has a big enough budget an in-use station can be used: Harry Potter and the Order of the Phoenix used Westminster as itself, and Rogue One used Canary Wharf as part of the Imperial base. On the subject of removing the spoil how about extending the Adwych branch to reach the river and keeping the removed earth underground until it can go into a barge? Alison W. I know you are joking, but all the same…. When the enabling Bill for the DLR Lewisham extension went to the Lords, it was modified by their Lordships to prevent spoil being removed by road. It was envisaged that spoil would have been taken by barge from a conveyor into Island Gardens, but in the end the spoil was spread over Millwall Park, to raise the level of the football pitches. (These previously flooded often, water table very high in this area). Joking or not, getting rid of the spoil in an acceptable is probably the biggest issue when it comes to presenting the statement of case for enhancing the station. Your example indicates what a showstopper this can be. AlisonW’s suggestion is not so daft. It would be quite reasonable to build a temporary shaft for a conveyor belt to extract the spoil from Aldwych to the Thames – presuming of course that the temporary shaft did not generate a disproportionate amount of spoil itself. The problem is that you probably need to start digging in Proctor St, or nearby, at surface level and this will not be connected to a potential conveyor belt route until you get to the last of the digging when you have got down to the disused Aldwych platform. Unfortunately, at Holborn, their luck has probably run out. I’m not sure how the detail would work out, but a general solution to the apparently recursive nature of removing spoil by tunnel is quite straightforward. Start digging the spoil-removal tunnel at the outlet end. For some strange reason, tunnellers tend not to be too happy about starting at the bottom of a future large big hole and digging upwards with thousands of tons of spoil that could potentially collapse downwards as they dug upwards. Just a thought. @Islanddweller, Alison: There is a branch off the Crossrail 2 underground safeguarding that leaves the main route south of Victoria, heads as far as the river embankment near Chelsea Hospital, and then stops. I believe this is to allow for the possibility of spoil removal by barge. PoP: Strange indeed. To continue my arm-waving “ignore the details” approach, you could always dig a small big hole in the downward direction, to meet the already dug horizontal disposal tunnel. (Small so there is not much spoil to store or truck away). Then the greater quantity of spoil resulting from enlarging that into a large big hole could be poured down the small hole to be conveyored away. Alternatively, I could just come clean and admit that I don’t really know what I’m talking about. @PoP: Indeed, although Crossrail have used uphill excavation for escalator shafts – and won awards for it. The Swiss built a subsidiary access tunnel for the Loetschberg ‘Basis tunnel’ construction, at the southern end, from the Gampel/Leuk direction, in order to assist with ‘muckaway’ and construction access, in addition to the main Visp portal. It is suggested that eventually this might be used for a new rail service from Bern towards Montreux, though there isn’t much sign of this happening yet. Possibly the rest of the Loetschberg ‘Basis tunnel’ would need to be doubled first (it is single track for only about half the distance under the Alpine chain, with a parallel small test bore for the rest! )… so not much urgency there, methinks. Apologies for taking this back off-topic but I am still confused by what is going on between Farringdon and Barbican stations. What exactly is a ‘low-capacity link’? Will it be advertised as an interchange or is it only for emergency use? I note that, unlike the original proposals, the Crossrail website no longer mentions any interchange with Farringdon station. My suspicion is that integrated Crossrail interchange with Barbican has been quietly dropped and it will just be an OSI from the Eastern Ticket Hall. I find it inconceivable that a footbridge/lifts can be built in just one year. Just checked the “Route map” Crossrail website and noticed that Barbican is not shown with a step-free blob, which must mean Crossrail doesn’t have a direct interchange with it. It’d be interesting to know the story of why/how this has been dropped as I don’t think it’s appeares in the public record anywhere. I’ll shut up on this now! I realise this won’t be very popular with various people, and notwithsanding the problem of tunnelling upwards, but is the obvious solution to the spoil problem to backfill the Aldwych branch tunnels with the spoil? If true, that’s a shame & a missed opportunity. Though it probably saves £20 million or so, perhaps? ‘Disused’ tunnels have a habit of being very much used and are often quite an asset. I think it is rare to fill them in for this reason. They tend to contain lots of cables and sometimes ventilation equipment as well as being useful for storage areas. The Aldwych branch could even conceivably be used as an emergency exit. And I don’t just mean in the Holborn-Aldwych direction. On a public visit to Aldwych station we were briefed as to emergency escape routes in the event of a major unforeseen emergency and the last resort was a walk up to Holborn. Needless to say, some in the large group rather hoped that would happen. Rather than digging a shaft to extract soil from Aldwych to the river, why not drag it up through the station? That doesn’t solve the upwards shaft problem of course, but then again, much of the new corridors will actually be on the flat. So if not all then perhaps at least some of the spoil can be removed via Aldwych? Whether enough of it falls in to that category that setting up such an extraction route is worthwhile I don’t know, and there are probably practical issues in terms of sequencing. Having no idea how much spoil is involved, I wonder if a temporary storage site, with later removal via Aldwych is remotely practical? I suspect not. DJL: The conventional, and obvious, way of removing spoil is by road. If that is to happen then it should probably be loaded into the trucks as close to its point of origin as possible. Any more exotic plan is probably only worth considering if it significantly diminishes the number of truck movements within central London. In the absence of zeppelins or nearby football fields requiring uplift, that can probably only be done (if at all) by river barges. So the task for any muckaway crayonistas is to devise an affordable truckless way of getting the stuff to the river Thames. Quite a tall order. When postulating the extension from Aldwych to Waterloo (which nearly happened), I wondered about taking the spoil for the extended tunnel out along the branch and the Picadilly Line “out of hours”, to a suitable train/lorry transshipment site in north London – the sidings at Arnos Grove, right next to the North Circular Road, would seem ideal for this purpose. Would it be possible to keep platform 5 at Holborn usable until the digging of the new interconnecting tunnels is complete, to allow this option to be used? I believe that the precise terminology for a ‘muckaway crayonista’ is: ‘Tonka driver’. I believe that was looked at when they were planning the Bank Station Capacity Upgrade. Basically, the problem is that ‘out of hours’ is as much out of hours as disused tube tunnels are disused. They are not called ‘engineering hours’ within LU for nothing. So actually you have trains running all night two nights a week and just five nights to do all the maintenance – weekend closures on the deep level tube are pretty rare these days and due to exceptional circumstances. The problems is that you would probably have to keep pretty much the whole tube line free of obstructions in both directions so preventing pretty much any maintenance being done. One muck train per night might squeeze into the maintenance timetable. But the number of truck movements that would save would be of the order of 2 or 3, I estimate. Games and candles spring to mind. @ Whiff – with the moderators’ indulgence I’ll explain briefly. The link is based around lift access from the CR platforms to an intermediate level which then links through to a bridge structure over the Circle line platforms. There are no escalators and given a lift has a low capacity that is why I used the term. You are not talking about hundreds of people a minute using the link. After much digging the planning application ref, for use in the City of London planning database on their website, is 11/00574/XRail. Load up the document list and then look at the Design and Access Statement (page 34 of the pdf). That has a section about the link and sketches of the proposed design. It’s reasonably self explanatory. What I can’t see from a quick search is another planning application to descope the link works. I am no expert on the planning system so it may be entirely in Crossrail’s remit to descope the works and let the permission eventually lapse. Clearly it is not a massive loss within the overall scope of the project but it would be nice if TfL / Crossrail were upfront about what has been removed from the scope. It is a public sector and publicly accountable project after all. With footbridges including lift enclosures usually being prefabricated, the absence of anything physical at this stage doesn’t mean a great deal. The whole thing including the foundations can be done very quickly. At this rate, someone is going to suggest loading small amounts of spoil into bags which can be worn inside passengers’ trouser legs. The passengers then release the spoil by pulling a string in each pocket which open the bottom of the bag. The spoil is dispersed by treading it into landscaped areas in Bloomsbury and Russell Squares. I’m sure I saw this method used somewhere. @Walthamstow Writer – With respect to Barbican and planning permissions (or indeed any other planning permission anywhere else in the country), it is quite open to a developer to pick and choose which parts of a planning consent they actually build. In 99% of cases they build it all, but if circumstances change they have no obligations to finish the job – at least not obligations through the planning system anyway. Additional consents would only be needed if they wanted to amend the scheme – i.e. build it in a different place, or to a different design. @Malcom – Well the Aldwych station access is already quite close to the river. I was imagining some kind of conveyer system between the lift shafts and the river, going down the middle of (a temporarily closed) Surrey street, then over the top of Temple station, over the road and then directly onto barges. That obviously requires quite a bit of setup and is perhaps more appropriate for a much larger excavation, such as an entirely new line. Obviously in light of the other factors already pointed out, this is probably a non-starter. @James, I fear you’ve missed the thrust of my post somewhat. I am merely advocating a removable platform over the disused trackbed, instead of a permanent one poured on top. I would like to know what figures you have used to assume this would be wildly more costly? Or, indeed, if such an option has been considered and discounted already? @WW, LVL: While planning permission does not have to be used, does the Crossrail Act commit Crossrail to building the whole scheme? I’m going only off my vague recollection of various past railway schemes where Parliament looked askance at attempts to only build the more profitable bits of approved schemes. In fact wasn’t that the reason that the Aldwych branch exists at all – Parliament refused to allow it to be abandoned even though by the time it was built it was pretty pointless because the Great Northern and Strand had merged with the Brompton and Piccadilly Circus? Meanwhile, is there building work going on at 33 Charterhouse Square (the building that the stairs to the eastbound platform will be built into)? Look at this map – assuming it loads properly. Note the dead-end short tunnels at the E end & the “stand-alone” block at the SE corner. And how that is vertically congruent with the extreme W end of “Barbican” station platforms. Memory tells me that there is a much older structure there, but that cutting a platform-level entrance for a lift-shaft would be ( by the standards of such things ) “easy”. IIRC, at present, it’s behind hoardings, anyway. Going back to Freddies comment re adding Elephant and Castle to the ‘to-do’ list. Theres a severe specific local problem. The shopping centre as is, sits in a concrete ‘boat’. The ground in the area is totally waterlogged. Engineering of any deep kind will require expensive special approaches, despite the real need. .
A recent experience with Brixton – following a delay of at least 6 minutes on the southbound in the PM peak at Stockwell a packed train arrived at Brixton followed by another 90 seconds later and another 90 seconds later with just 2 escalators to get out. The station staff were still letting people in none the wiser and it felt so claustrophobic. All in all it took about 5 minutes to get out. In an ideal world this station would have an exit on to Atlantic Road for the National rail station where there is a steady stream of interchanging passengers and pedestrians for the hinterland. That standalone block on Hayne Street is odd, because it is not connected to the rest of the station. It could be an exit from barbican, to allow street-level interchange to the eastern ticket hall at Farringdon round the corner, but why bother when interchange between the same lines can be done, more easily, at both Farringdon and Moorgate? Also, it appears to be over the former Thameslink tracks, now to be used as sidings, rather than the Underground ones. Could it be there to give staff access to those sidings? Or is joined-up thinking between Crossrail and Thameslink too much to expect? (Will Thameslink connections (at Abbey Wood, Woolwich and Farringdon) even be displayed on Crossrail in-car diagrams, other than as the unhelpful “National Rail” (to where?) sign?) . In the BBC documentaries about Crossrail I remember them having to sink an extra shaft at Barbican to aid tunnel fit out. Isn’t that the extra block on the SE of that map? If so it would explain why it isn’t connected to the rest of the station. I seem to recall that the shaft mentioned was in the middle of the construction site and not separate. By the way, at a talk by a Crossrail engineer, he warned of over-value-engineering. The suggestion was that the shaft had to be built in a hurry because value engineering had removed the original planned route for tunnel fit-out. It seemed the right decision at the time but the full consequences to the construction plan of using the intended alternative were not appreciated at the time. PoP I recall the shaft in question being in Barbican station, hence my thought it was that shaft. I wonder a) how much extra the shaft cost compared to the original (removed) plan. And b) how many other things were value engineered out that in the end weren’t needed. Surely value engineering is a risk exercise, sometimes you win, sometimes you lose. After all taking it out meant they probably didn’t spend the effort proving it was necessary and so saved some money. I hadn’t thought of value engineering as a risk exercise. I don’t think the speak was against it – just warning of over-enthusiasm. I suppose a summary of his and your thoughts is ‘fine, do it, but be prepared to accept the consequences’. It’s interesting to me that Holborn is considered a dependency for the Deep Tube Programme while other stations are not. I foresee a lot of skip stopping at busy times. What to do? 1) Publish a priority list. This may well include the closure of Covent Garden station and an entrance to Leicester Square station in Covent Garden. In any case, many people walk at street level to avoid the interchange from the Northern Line and the crowded lifts. 2) Work to a published skip-closure timetable of the over-capacity stations in peak times. So long as people know a train won’t stop, they can have a choice of waiting for the next train or walking the short distance of a single stop. 3) Do something relatively cheap at Green Park, at least for now, and nothing at street level. Moving walkways would help as suggested earlier, although I acknowledge that it would be sub-optimal. As explained in the article, Holborn is necessary partly because it is needed to house a new substation so it is somewhat more urgent than other stations. There really is a dependency whereas I suspect that numbers using Covent Garden will rise anyway regardless of whether the increase in frequency due to the Deep Tube Upgrade takes place or not. I also suspect that the busiest times for Covent Garden are not necessarily conventional peak hours. It certainly can be very busy in the late evening and it has just four lifts. The case for Covent Garden is probably exceptional because the station will be affected for much of the day if an upgrade does not take place in the next couple of decades. So not so much a case of trains not calling at certain times of day but more a case of closing the station completely if demand cannot be met – politically this would be extremely hard to do. @PoP: If you do close Covent Garden, then you’d just be shifting the problem to Leicester Square. Could that cope? I strongly suspect that it would struggle. Probably not. I suspect there will be a concerted effort to persuade people to use Holborn as the alternative if we got to that situation. @ Ian S – I can’t see the point in having skip stops in Central London. The fact is that trains not scheduled to stop will still have to stop in platforms anyway. You might as well let people on and off. I agree with your basic concern that there are far too many stations in Zone 1 on the Picc that are too small for today’s demand never mind the future. However this is what you get from a poor policy and funding framework that has largely neglected station capacity issues for 20-30 years. Clearly we have seen a bit of progress recently but that pace will slow given the funding environment. @ SHLR – having been a long term user of Leicester Square and commuting on the Picc I can’t see Leic Sq being able to take up much slack from Covent Garden. While not overly stressed in the AM peak it is off peak and right through into the late evening plus weekends where these two stations are under strain. Again both stations have had plans for improvements in the 80s and 90s but nothing came forth in terms of sustained funding to allow them to be expanded. The opportunity at Covent Garden has possibly gone forever given the mass commercialisation of the area by retailers. To shift people out and acquire the necessary land may be beyond TfL’s means never mind the planning issues. Re Ian, PoP, WW et al. The main issue is actually probably how much CapCo’s finances take a hit from the massive Earls Court site redevelopment and whether it still exists at “that” point in time. I suspect all the alterations and delays (mainly geology) at Farringdon/Barbican means that construction there is more visibly behind schedule that at any of the other Z1 stations. That TfL map also hints that TfL have at least made some of the changes need on the map to put Thameslink on if it comes to that. @ngh: Diamond Geezer has a good analysis today…. @ Ian S – the long term solution at lift stations is to add capacity in the most feasible way. The same applies at stations that are short of escalator capacity (several on the Vic Line). This is why I “bang on” so much about station capacity being an issue that requires a long term strategy and secure funding despite the expense. The apparent notion that we can keep on ignoring this is baffling (to me). It is ludicrous to spend billions on line upgrades whose time saving benefits are then negated by taking 10-15 mins to exit a station or having to queue for 20 minutes to enter it, That’s just back to front logic to me. As PoP has said I do not think closure of tube stations will ever be politically acceptable in London. No Mayor will want that “achievement” hung round their neck for posterity. @WW: Ah, but the travel times are wonderful marketing collateral as well as a re-election vote winner! Also re: Barbican interchange, in Geoff’s video tour of the new Crossrail station at Farringdon, he is shown the escalator and inclined lift which link to the westbound platforms at Barbican. In slight fairness to the advocates of time-saving benefits of new lines, the time saved is for travel all day and every day, where as the 10 to 20 minute queues to enter/exit only apply to the very busiest parts of the day and week. But yes, I do agree that station capacity is still a very urgent requirement – including for safety reasons. The Piccadilly line will have been waiting its needed upgrade around 30 years if it arrives as planned in 2025/6! In the mid 90s a timetabled frequency increase was limited by the current signalling, installed at a time of falling demand, and was soon abandoned. Never-the-less, withdrawn 1983 stock was retained in 1998 in hopes of providing a larger fleet for the line. Then the PPP scheme promised an order for 2012 stock which, together with resignalling by 2014, would have provided a 20% capacity uplift. We have waited so longer, the upgrade is now promised at 60%! @Taz – I think that public at large have forgotten just how corrosive (literally so in the case of the rolling stock) were the consequences of renationalisation coupled with the abolition of the GLC. It was clear in 1983 that Ridley didn’t wish to be told that the tube required a certain level of regular investment, and that philosophy persisted until the audience changed in 2000. The PPP was, as elsewhere, an attempt to slide out of the consequences of the delay. As any professional knows, you cannot have an investment holiday without storing up expensive trouble. I have a Peanuts cartoon, showing Good ol’ Charley Brown saying “no problem is so big or so complicated that it can’t be put off until tomorrow”. I’ve had it for more years than I can remember. Is it true that privatisation of the Property Services Agency approximately halved the number of Chartered Professionals in the Civil Service? @ PeeWee – While I know what was said on that video clip it’s not strictly correct. Those escalators and inclined lift go from platform level to an intermediate level at Farringdon East. You then walk along and reach another set of escalators / lift to reach ticket hall level. The interchange link to Barbican is, AIUI, accessed from the intermediate level itself. 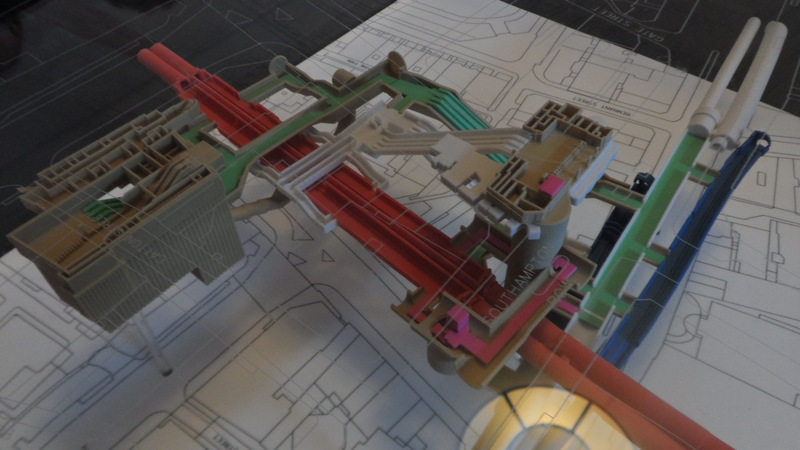 I know I am being very picky and obviously the statements were made in good faith but without seeing the intermediate level we haven’t actually seen what the link will look like from within Barbican station. The other thing that struck me is the apparent change of opening date. I thought Crossrail opened on the day the National Rail timetable changes in Dec 2018. However the implication of the end of that video is that opening is on Wednesday 19th 2018 which strikes me as rather odd unless they’re using the days before hand for some sort of preview service / look at the stations plus the inevitable royal opening ceremony. @Alan Griffiths -nearly a century before Charlie Brown, FM Cornford’s “Microcosmographia Academica”,in discussing the various arguments for not doing something, identifed, along with the Thin End of the Wedge argument, the point that doing nothing couldn’t possibly have consequences. [There’s also a relevant description of the only two possible party positions. Available as a download, possibly also as a reprint. Essential reading for all aspiring politicians and bureaucrats]. @WW Methinks you are missing the month in your second paragraph. Graham H – perhaps some of the PSA professionals could have been usefully engaged in removing hot air from the vicinity of ministers? @!30 – 🙂 You mean as in the university in whose wash room a notice appeared by the hand driers, labelled “For a short message from the Dean of faculties, press here”? Actually, I used to find it quite insulting that some ministers repeated to officials in private, their public banalities and nonsenses. @130 – I should have added that heating and ventilation were key issues for the Post Office (whose building requirements formed the part of MPBW/PSA in which I worked) – the effort expended in sorting offices served to warm them, but not, of course, ventilate them. @ LBM – thanks. Should refer to 19 Dec 2018. The new trains coming to the Piccadilly line promise a 60% upgrade, but the same trains on the Central line offer only a 25% increase. Where do these numbers come from? The previous Piccadilly trains were 7% longer than the current ones, so it seems reasonable that the new ones will again fill the platforms. Then the new service promises 33tph compared to current 24tph, although this was promised 36tph at the time of the 2014 Kings Cross launch. Current 100% x 1.07 x 33 / 24 = 147%, but x 36 / 24 = 160% so I think 60% uplift comes from the original 36tph plans, not the current ones. This makes no allowance for standing in the new walk-thru car ends, or greater standing areas and less seating on the new trains. The current Central line trains already fill their platforms with 27tph peaks, up to 34tph equivalent for limited periods. Uplift to 33tph is 22% from 27tph, but only 3% for the peak hour. The 36tph previously promised 33% uplift from 27tph but only 12% for the peak hour. The three hour peak uplift will therefore be around 16% to 33tph, or 26% to 36tph. So again the 25% uplift quoted is likely from the original 36tph plans, rather than the current ones for 33tph. Either way, the effects on passenger flows at Holborn station will be uneven between the lines, and reduced for the busiest hour on the Central line. I think you and I are on the same wavelength. If the policy advice is about the suitability of very long contracts, including maintenance as well as investment, an Engineer might have lots of relevant knowledge that an economist has never heard of. @Alan Griffiths – ! I must admit to preferring engineering advice every time. Later in life, when I came to work for investors in major projects, the economists were nowhere in sight -that should tell us something. If the Bakerloo is to go above 30tph then it will need either a bay platform at Elephant and/or 3 or 4 platforms at Lewisham, otherwise it won’t be able to reverse the trains fast enough, even if the signalling can do 90 second headways along the line. As Elephant & Castle (Bakerloo line) has surprisingly few passengers and they managed 30tph (just about) in the days when the trains went to Stanmore I am pretty sure they could manage more than that with decent modern stock and signalling. Equally, if Brixton can manage 36tph why could an even better designed terminus at Lewisham not do so? Even if two conventional platforms were not sufficient at Lewisham, I would argue a better alternative would be to have two platforms per track with the centre two platforms being linked departure platforms and the outer two being arrival platforms. Um…yes it does tell us something. Major private sector investors just care if the revenue from building the project will cover the cost, with something left over for profit. Hence no need for an economist. But public sector projects, such as a new rail line, calculate the public benefits not captured through fare revenue (e.g. such things as consumer surplus and externalities) which a private investor has no interest in. Someone (such as “an economist”) has to work out some numbers for these benefits if a case is going to be made for the project since the fare revenue won’t cover the cost (if it did, then it can be built by the private sector). @aneconspeaks – of course, but then bankers didn’t understand anything other than cash. I have to say,however, that conversations with many public sector economists left me feeling that I had just returned from a voyage to Laputa*. As with lawyers, the best sort began by asking what was the answer you wanted. *In DTP,matters were not helped by the long term senior economist being HJD Cole (the model for Dr Cartwright in Yes,Minister). Apart from an unspeakable taste in mustard yellow tweed suits, he was visibly (and,alas,audibly) lacking in social skills,something I came to appreciate close to when I was tasked with acting as his amanuensis on a review of our research establishments, which culminated in Cole stalking into the back of a training session on something or other and saying loudly to me – and audible to the lecturer”This man is a charlatan”. I quietly arranged for the review to peter out. Cole’s reputation for an obsessive academic manner went before him; there was the famous Christmas pudding incident in which Cole appeared in the canteen surrounded by fawning acolytes, holding forth on some point of economic theory, too busy to notice that he had just helped himself to an extra large helping of horseradish sauce in the belief that this was brandy butter. Others did notice, however, and the crowd surrounding Cole grew larger in anticipation of his first mouthful. At the moment in question, Cole was holding forth especially vigorously and the spoonful of pudding plus horseradish simply passed inside without a blink. Great was the disappointment. I have to say,however, that the economists on my team were very different and quite as adaptable as the rest of us to finding solutions to policy questions. You really MUST persuade Lord Dawlish to write his memoirs! Can’t say I’ve actually written (as opposed to spoken) the phrase before. No doubt derived from procedure undertaken during 3 or 4 rail electric train running repair. Requires use of long handled wooden paddle carried in cab. Nameless should keep up. The “shoe-in paddle” has been made of fibreglass since about 1965, just like electricians’ ladders. Actually, I’d assumed that the shoe referred to was that used in casinos! @Malcolm: But the shoe itself still seems to hang off a bit of wood! The unused Aldwych Branch tunnel was once the site of an Astronomical Observatory. This was the only one ever on the Underground as far as I am aware. Does this proposal mean that this part of history will be destroyed ? We asked around and are reliably informed by Anthony Badsey-Ellis, who co-wrote a book on the Aldwych branch, that there is no trace left of the experiment. Apparently it began in the 1930s and lasted until 1993. The area used for it was gutted and reconstructed around 2008. So the answer is no – it was destroyed long ago. And the usual not-entirely-accurate press release. Passenger traffic may have been doubling every five years but over the past two years it has actually gone down slightly. @ Stuart – yep cheap but also TfL have entered into a development agreement for housing at Southwark so I dare say the returns from that may well pay for the extra entrance. Have to say I am somewhat surprised to see this new entrance being proposed now. I thought there were similar plans for an additional western entrance at Stratford but that’s gone extremely quiet. I can’t understand why the new entrance at Southwark was not provided from the outset. The current arrangement already has all the gates needed and certainly had a ticket office until recently – it retains ticket machines. Indeed, a public entrance would have been the one thing that would have made sense of having two adjacent gate lines at an interchange where otherwise every passenger had to meaninglessly go through both gate lines. All that is needed is a door. As well as steps (no step-free provision being made), a roofed area and signs, I’d imagine there would be modifications to the surrounding street-scape to make it more appropriate for the volume of pedestrians that will be on those back streets should an entrance open – which those renders suggest will be the case. But still, a very cheap additional entrance to Southwark (and, pretty much ignored by TfL and the press, Waterloo East) with little work needed. If only it was easier other places where an extra entrance/exit is needed! Indeed, Waterloo East passengers will probably benefit more – the existing access to the station involves a long trek from the SW station, or a slightly shorter trek and an awful lot of stairs from Sandell Street. Has anyone else noticed the irony that planning permission is needed from LB Lambeth (not Southwark) for this. Southwark station is badly misnamed – I have known people visiting Southwark Cathedral complain bitterly about its distance from the eponymous Tube station! Wasn’t there a theory years ago that the local planners didn’t want a direct eastern entrance to Waterloo East, and that’s why it was basically built for interchange only? It’s no further than Westminster Cathedral is from Westminster station, or, indeed, several other cathedrals are from stations with the same name. Any expectation that the cathedral must be close to the station, or the station renamed is surely foolish. Not quite comparable with Westminster, because “everyone knows” that Westminster covers quite a large area. Southwark, being less famous, sounds to a non-Londoner (or even many north-Londoners who don’t go south of the river much) like a small area, even though it isn’t really. Just to complicate matters further, there are actually two Southwark cathedrals, one south of the station and one east. And Westminster is less well known and visited with many tourists referring to the adjacent Abbey as the Cathedral. The fact remains that the traditional area of Southwark is the area at the south end of London Bridge (at the time the name of Southwark was coined, the only bridge across the Thames for twelve miles or more). Half of Southwark station is not in the borough of Southwark at all. It is of course by no means unique in that regard – Tooting station is in Mitcham, Clapham Junction is in Battersea, Hampton Court station is not even in the same county. As I understand it the local residents strongly opposed it, as they also opposed Network Rail’s proposal from 2009 in the same location. Presumably TfL now feel that they can either get the permission from Lambeth council that was denied to Network Rail, or that the council are likely to be over-ruled on appeal. The reason this is happening now seems to be because the over-site development of the main entrance to the tube station is finally showing signs of happening. There has been a low-level controversy in the background about whether the current tube station entrance will be demolished (it was designed to have a development on top of it but apparently not one of the height now proposed).